Can't say I like the fish sticks logo, but I can't complain about the jerseys. The NY rope logo is well designed, but isn't made for sports, imo. Thanks for the comments! Unlike my last series, we are headed towards the finish line. Next! Time for another unpopular opinion. I love the Fisherman update of the early 90's and think it blows their dynasty look out of the water. That being said, I thought it could use a clean up so I straightened the wavy stripes and got rid of the wacky yokes. I thought it was important to make orange the secondary colour so I increased the size of the stripes to establish that hierarchy. The 'NY' monogram appears as a helmet and pants logo and lace-ups are used for balance. The alternate is refinement of a previous Islanders concept as I spent some time refining my logo. C & C appreciated, thank you for looking . Wow, you made the Fisherman...look good. That's amazing in its own right, but I think the NY logo should be on the Alternate and the Anchor on the shoulders , but overall, This is amazing. Three more! 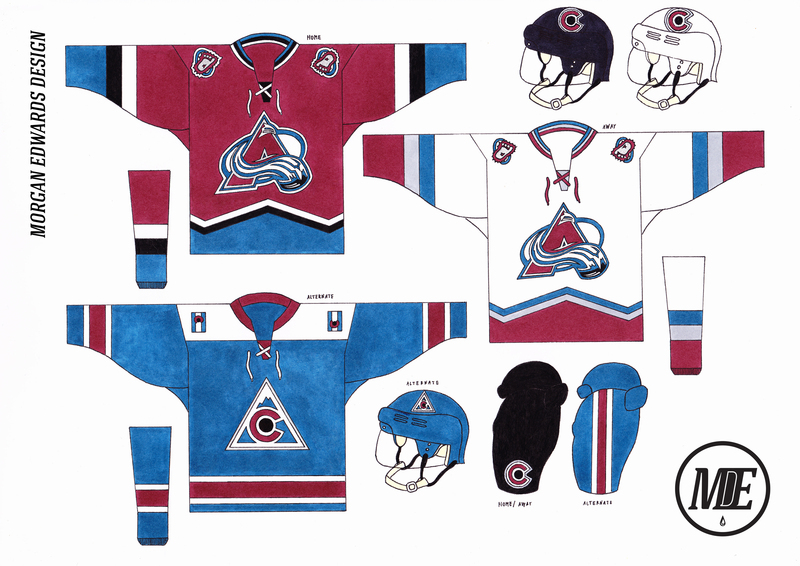 Anyone who's paid attention to any NHL uniform discussion on here knows my preference for the Avalanche original look. The term modern classic gets thrown around a lot but by their 2001 Stanley Cup triumph, that is exactly what the Avalanche had. Still, I think mountain range pattern on the sleeve-to-shoulder yokes hasn't aged as well as its hem-stripe counterpart so I replaced it with thick, bold stripes. I always liked the tri-coloured collars of the original set so I went with that configuration in the form of a lace-up. Their original logo set is perfect in my opinion so I went with Colorado logo on the helmets and pants. The alternate is an attempt to salvage the Rockies re-colour and it's accompanying uniform. Went with the lighter shade of blue for more contrast and recoloured the Colorado flags which now appear on both shoulders. C & C welcome appreciated. Two to go! I feel the alternate's striping needs a little bit of black due to the black in the logo, but besides that this is a fantastic set for the Avs. Great work here. Alts aren't bad the only big problem I have with it is the pants being that blue color too. Imagine it on the ice, that's just way too much blue. Second last concept of the series! 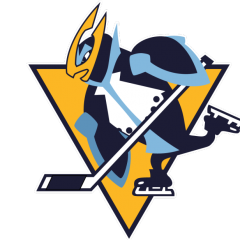 Since the Peguins are black with white and gold highlights already, I decided to go in a different direction for Boston. The home jersey is based off their 2010 Winter Classic uniform with the current logo in place of the pregnant B. The alternate is a fauxback based loosely off their 1949 set with their current alternate logo on the front. I also added a vintage white yoke to add to the retro feel. C & C welcome and appreciated, one more to go! Well, it's Boston alright, it's good I always liked that Winter Classic uniform, so I like this set as well. One more to go! I can't see the Bruins image at all. Can anyone else not see it? Please let me know if it's not showing up, I can see it on my computer. Well here we are. The last concept of the series (for now). A set of opposites. The goal was to make the main set as classy as possible and to make the alternate as outlandish as possible. The striping was designed to compliment the logo and they stop abruptly on the sleeves to mimic military badges. The shoulder yokes were applied to reinforce traditional hockey aesthetics and provide contrast to the comparatively busy striping. For the alternate, I knew I was going to use their original scheme with the electric green but thought "why not go completely all out?" 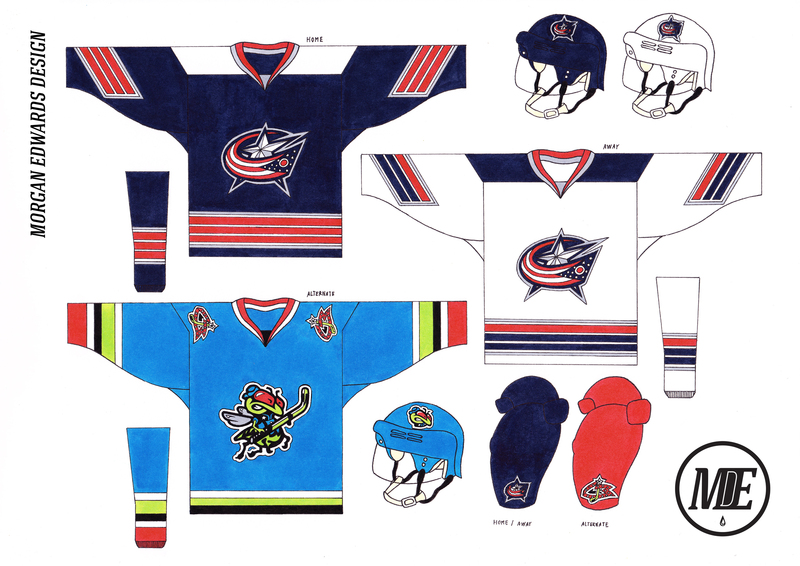 I used the full bodied Stinger as a crest, replaced the navy with black and worked the green into the striping. Traditionalists will hate it but I'm really happy with how it turned out and it might even be a favourite jersey of the series . A big thank you to everyone who commented and for all the kind words. This series has been a labour of love and I will be back with updates in the near future. Cheers! You do excellent work. I love your attention to detail on the helmets and pants, plus excellent uniform designs. I want to buy that Stinger alternate, I kid you not. 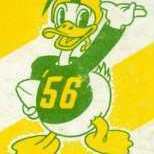 I also like the striping motif of the home/road uniforms, which fit well with the military badge aesthetic. Fantastic work! You've been on a roll with these concepts. 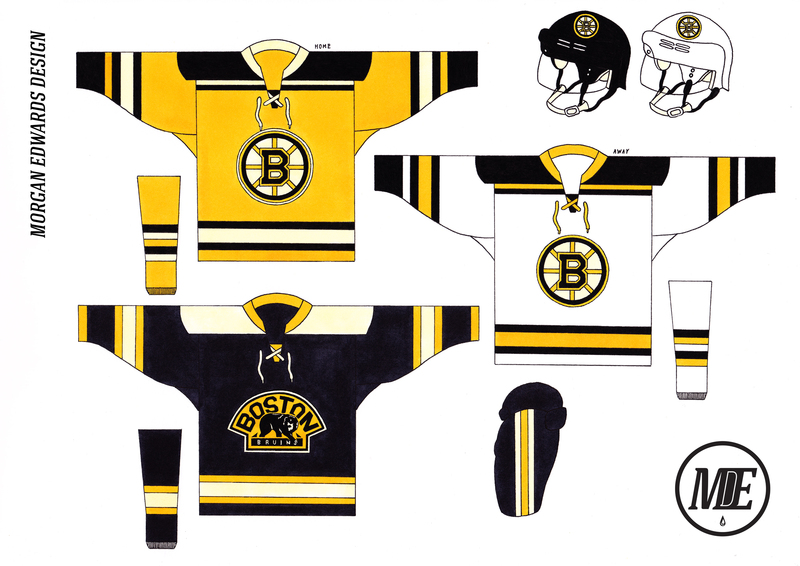 Bruins: I've always wanted to see a set built around the Winter Classic uniform, and you've satisfied my curiosity. 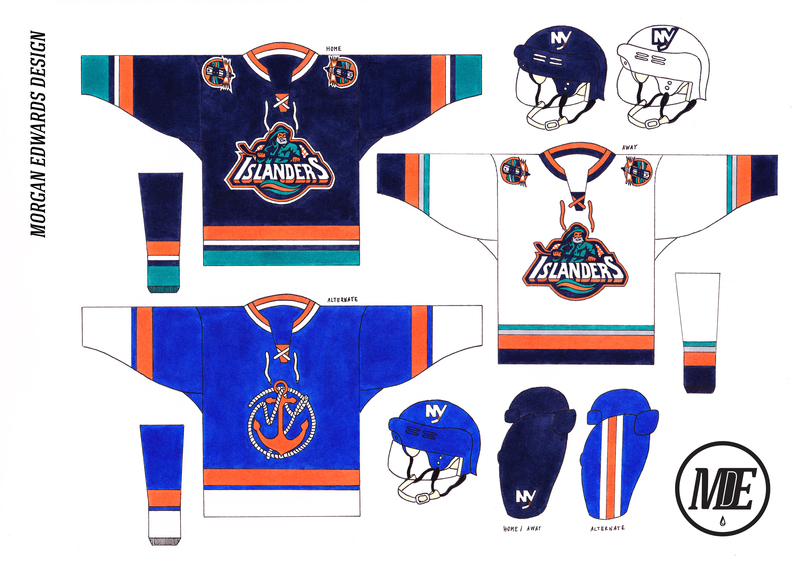 Islanders: You've salvaged the Fisherman uniforms beautifully, and I'm happy to see your anchor logo come back. Rangers: Aside from putting the shield on both sides of the home uniform's shoulders, I like what you've done here. The minimalist take on the Lady Liberty alt is especially good. Jets: The arrows and powder blue base are excellent changes, which really benefit the logos and making the team distinct from the other navy teams/the original Jets. Maple Leafs: I'd add a blue yoke to the white sweater, but other than that, it's some good work (I love the St. Pat's-esque look)! Canucks: It's good to see ol' Johnny get his due as a crest! The return of the "VC" is also fantastic (it should maybe replace the Stick-in-Rink on the shoulders of the home/road sweaters). Sharks: You've made fine use of the inaugural template and the new logos. I'm not totally sure about pairing a teal helmet with the home sweater, but that's just personal preference. Lightning: I think you've found a perfect way to balance the team's aesthetic history with a solid, modern look. I agree that the alt should have lower sleeves, but that's a minor complaint. Hurricanes: The new crest is wonderful, and the return of the hurricane flag stripes is a welcome sight. Blackhawks: I like your helmet logo, and the return of the five-stripe pattern to the home sweater's sleeves. Nice one. Flyers: You've done well to split the difference between the current and Lindros-era looks. The alternate is probably the best "modern" look the Flyers could have (although the inverted logo will take some getting used to, for me). Well done. Sabres: I like this optimization of the goat head, even if I'm not a big fan of that set (aside from the red alternate's crest, which was beautiful). Kings: The redone home plate logo is solid, as is the simplified crown and grey alternate. I'm not keen on keeping the sleeve/shoulder piping, but that's neither here nor there. Good work. Canadiens: This is a fantastic optimization of the Winter Classic look! Blues: It's a good balance of the current logo with the classic color scheme. The alternate makes fantastic use out of the notation pattern, with just the right amount of royal blue and white. Oilers: Your new crest and color balance are fantastic, and you've made a hater of the navy/copper/red set a fan with that alternate! Devils: The home looks better than the road. I'd suggest some white space in between the red and black on the striping. Red Wings: The new striping works well with the team's retro aesthetic. All in all, you've put together a fantastic series! 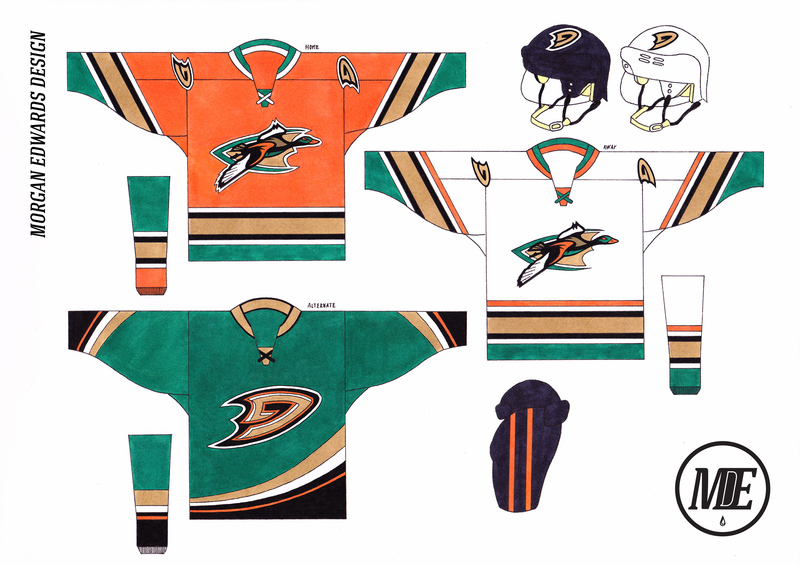 It's remarkable the jerseys you draw look better than some of the digitilized concepts on here. Great work all around. No complaints. I'm in awe of your artistic ability. Morgo, I always enjoy seeing your work. Each one of these looks fantastic, and I can't imagine how much time and patience it takes into putting these concepts together. Back after a long absence with some new updates! I have 9 new drawings to share and I'll be posting a new one each day. A discussion in one of the NHL threads inspired me to do something completely different for this team. I centered this identity around two prototype logos from 2006 and added jade to their colour scheme to acknowledge the Mighty years. The striping of the main set in inspired from their short lived alternate that predated their name change. The alternate is an attempt at salvaging what the team actually went with. C & C very much appreciated, thanks for looking! Sens: absolute perfection. Especially given how some of us on the boards are griping about how they’re moving ahead with their identity without the 2D/sidefacing senator logo. Your concept gives them that regal look while also focusing on the 2D logo (their best). 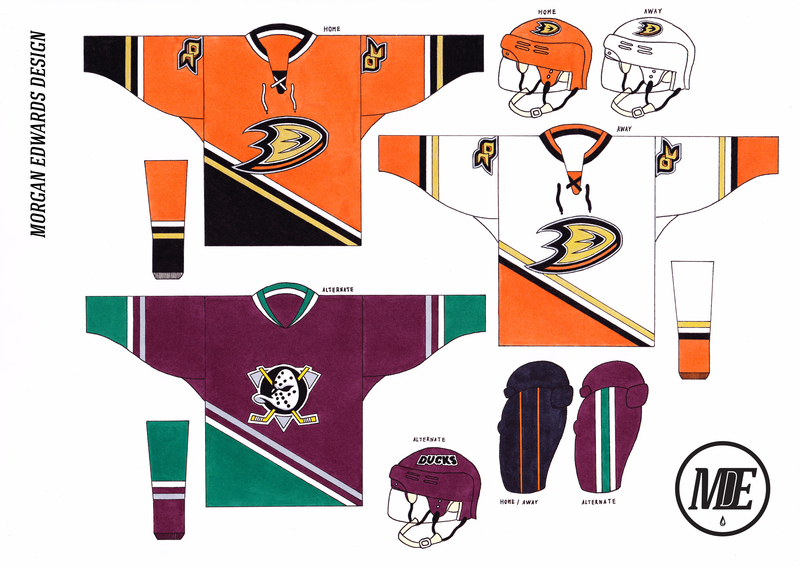 Ducks: there are so many black-centric teams in the league that it’s refreshing to see an embrace of the secondary orange as the pillar of this set. Everything from the D being the crest to the diagonal stripe is amazing. Yotes: love the sublimated rising sun as well as the cactus logo! Lightning: sooo beautiful! 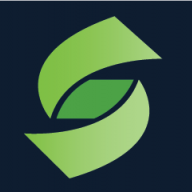 Your concept gives life back to the Maple Leaf rip offs and gives them a unique identity and crest back! Love the chevrons on the Jackets as well. I could gush for hours on these concepts.